We had hunted the morning, in a location about two miles to the north, but nothing showed. About 11:30 AM we shifted to a spot where a gobbler had been hanging out. After about 30 minutes of sparse calling, a gobbler sounded off from behind us. I suggested to Tom that he turn to prepare for an approach from that direction. Within a minute, a second gobbler appeared and fanned out about 150 yards away in the opposite direction from the first gobble. Tom managed to scoot around just as a hen turkey passed by at ten yards. The strutting bird couldn’t resist following the hen and soon Tom had his chance. My heart sank after the gobbler took off at a fast walk. Fortunately he didn’t last long, and Tom caught up with him as he dropped and rolled down the hillside a few yards before coming to rest on a level spot. It was a great ending to turkey season. Looped around the perimeter of Mayberry last Saturday. Because our property is permanent marsh, most of the wildlife is just across the drainage canal on the grazing ground. 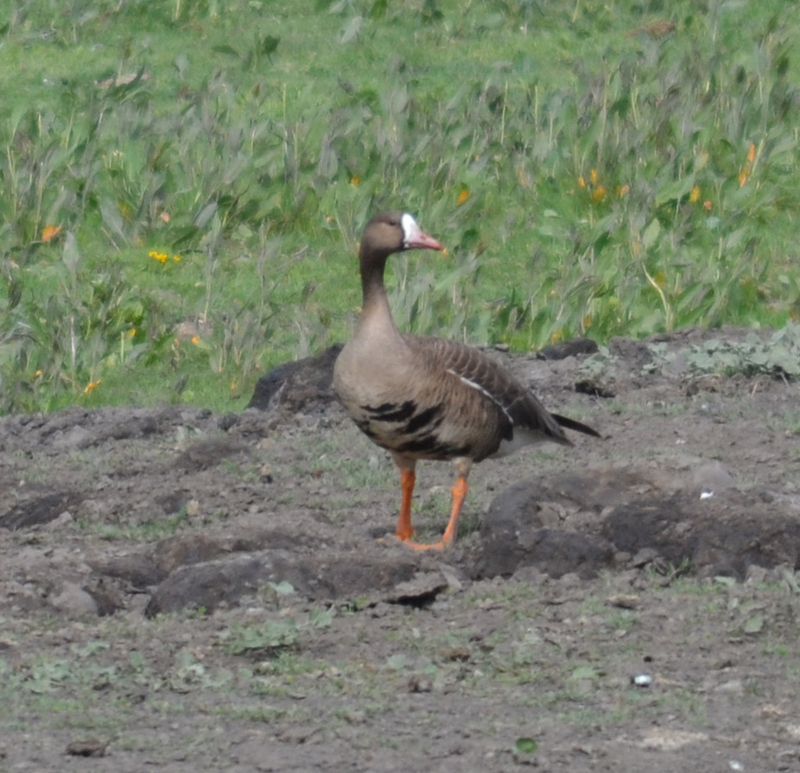 White-front geese stage at Sherman Island and it looks like they are about ready to head north. Not sure why this single spec didn’t take off with his brethren, but he eventually flew off to join them. As I watched some waterfowl, waiting for a good photo opportunity, I heard a splash in the canal next to me. 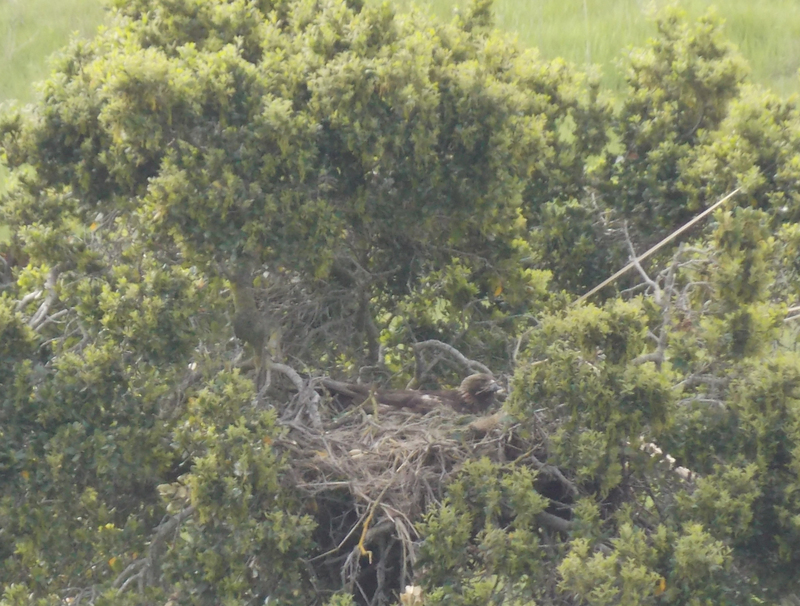 Figuring it was river otters, I paused before turning to look. 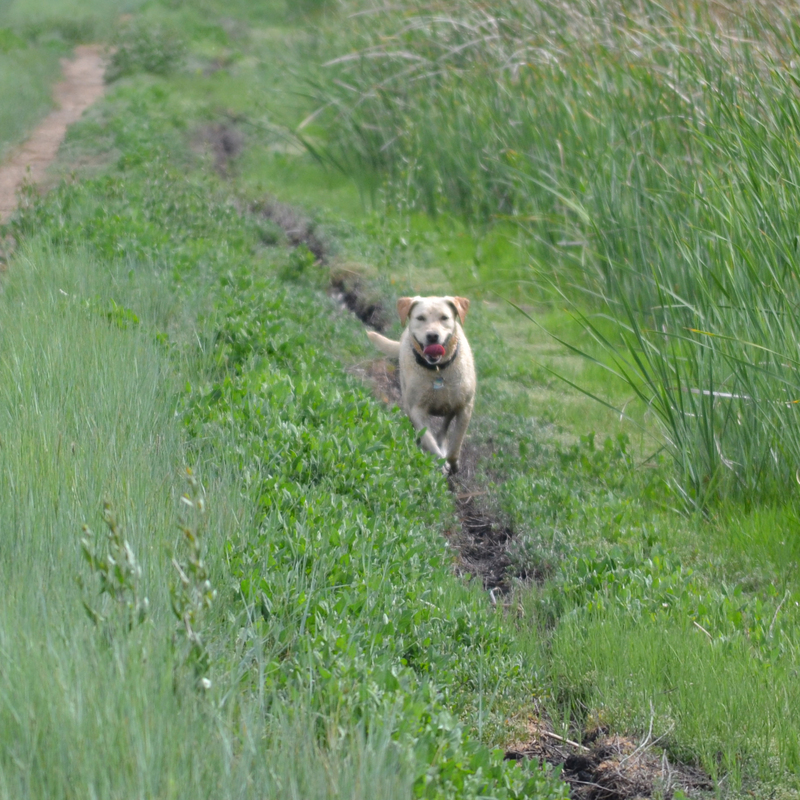 When I did, it was just in time to see a coyote dog-shaking to get the water off his back. 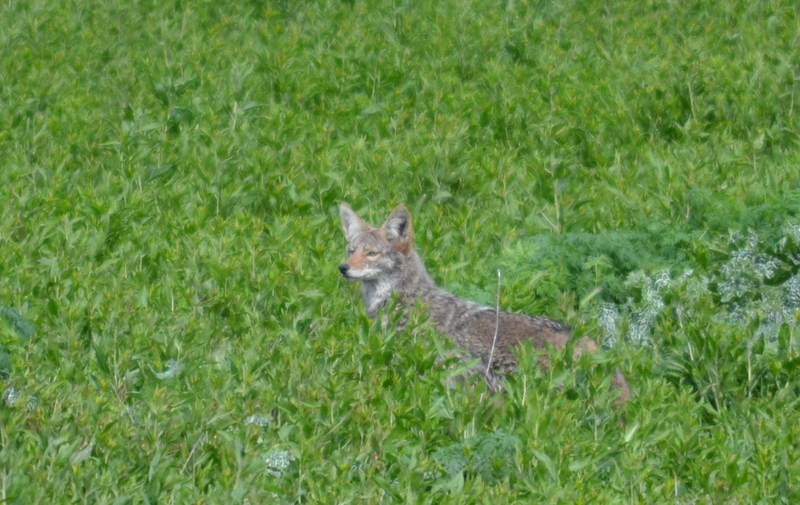 The coyote was nearly hidden by the tall growth. Lola was very excited to be back in her element. 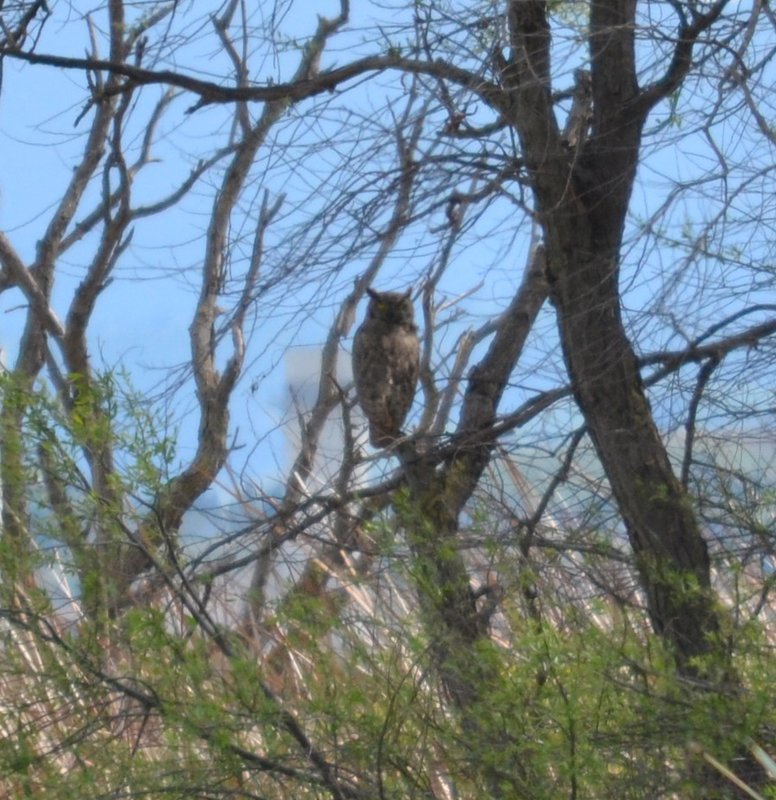 A horned owl, rested in a willow tree until Lola scared him off. 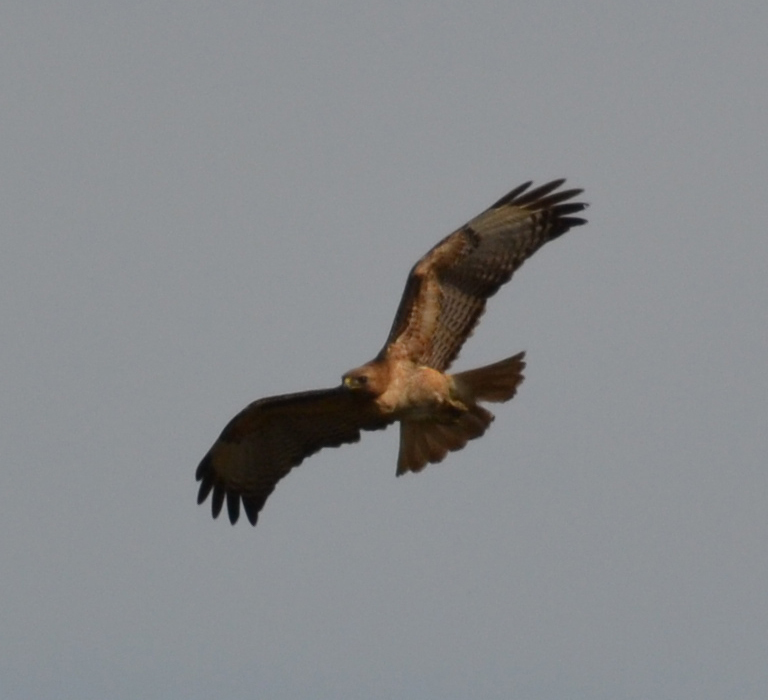 A red-tailed hawk took off from the field across the canal. Lola jumped up a rooster. The goats of Mayberry were back, cleaning up the vegetation on the levee. Hope they left enough cover for the pheasants to nest. It was a great couple days at Mayberry. Fishing was good and I was getting some pretty good photos as Lola and I walked around the property. Working some thick cover in a location where we often find pheasant, Lola was red hot. I could hardly keep up with her. She ran out in front to about 100 yards and turned to work here way back, nose to the ground – going in and out of sight in the cover. 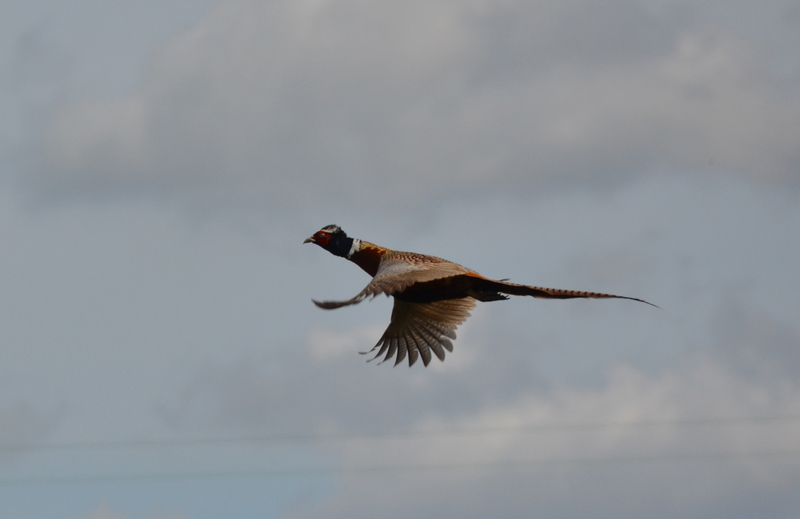 The rooster rose quickly from about 50 yards in front of me and passed me at about 30 yards. I swung the Nikon and snapped a shot. What were the chances? To fully appreciate, click on the photo to enlarge it. It was a direct hit with good light and he was cackling all the way. Saturday morning I continued my quest to bag a gobbler with archery equipment. I headed to the ranch in a good frame of mind and photographed a golden eagle nesting on the way out. Click on the photo and you’ll enlarge the eagle. Arriving mid morning I set my hunting clothes out next to my folding chair, picked up my box call and sent a string of yelps out to see what would happen. While dressing, within a few minutes after calling, a gobble sounded in the distance. All right, I thought, they’re around. I was feeling rather casual about this hunt, so I took the chance of yelping one more time. A gobble sounded closer than the first. As I put my boots on, movement caught my eye and a gobbler popped up only twenty yards away. Talk about not being ready…..but I didn’t really care. My plan was to hide in an old barn, while setting a decoy out where I would have an opening to shoot. Two other openings might provide a chance for a shot as well. I moved my chair into the barn and set out the single hen decoy. Holding the box call outside the door, I let out a few yelps. I expected quick action as there seemed to be more than one gobbler in the vicinity. Sure enough, as I faced the decoy, a gobbler appeared behind me and it passed by one of the other openings. Soon, another gobbler appeared and followed the first. They were both mature toms with long beards. Excited, I tried to think on my feet. I turned and tried to draw my bow as the second gobbler passed through an opening, but it didn’t work out. Then the big bird turned and headed back to an opening. I drew the bow and tried my best to get on the bird. Thinking I would be on target I released an arrow. Nothing. Not even a feather. Realizing that I probably had executed a perfect example of target panic, I tried to calm down and take advantage of the fact that the first gobbler was still standing 20 yards away and I’d probably get another chance. I could see the bird and it wasn’t going for the decoy. Instead it was behaving a bit nervous and began to walk in the direction of the departed gobbler which had flown off after the shot. I concluded that I should make a single yelp to stop him when he approached the opening. As he neared the opening, I drew my bow and yelped as the gobbler stepped into view, framed within an old doorway. The gobbler stopped, providing a perfect broadside shot at 20 yards. Taking more time to aim, the stationary gobbler would be mine. At the release, the arrow smacked the bird and it ran over the brow of the hill and out of sight. It appeared to be a perfect hit, but I’d been through this scenario before, so I tried to remain objective and go through a thoughtful progression of evaluating the situation. I departed the barn and removed some of the gear that was weighing me down. Sliding under a barbwire fence, I studied the feathers left behind and spotted my arrow. I was disappointed to see that the arrow had no blood or moisture on it. The arrow had passed through feathers, but apparently not the turkey’s body. I searched the area anyway, and found no evidence that the bird had received a damaging blow. Two twenty-yard shots and no turkey – not even a good hit. At least I was gaining experience. As I wandered and checked the area for any sign of the gobbler, a different gobbler appeared over a slight ridge, I ducked down and lost sight of him. 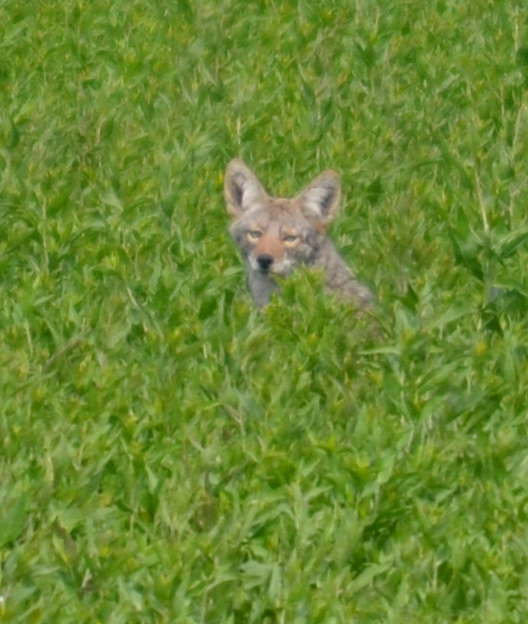 It appeared that he might be heading my way, so I sat on the ground and pulled an arrow, but before I could get my bow vertical, he appeared about 20 yards away, staring at me. Eventually, I tried to raise the bow, but it didn’t work. Before I knew it the bird was 40 yards away and departing the area. I followed and set up next to a large oak tree. I yelped with my mouth call and before long the gobbler returned, but he passed by too far out and I was afraid to call as I was sure he’d spot me. After he disappeared again, I tried a call and he gobbled, but didn’t return. Later I observed that he had found some hens and was preoccupied. Waiting patiently, I hung out by the large oak. It was about four feet in diameter and provided lots of options for hiding. I sat where I could observe the turkeys. 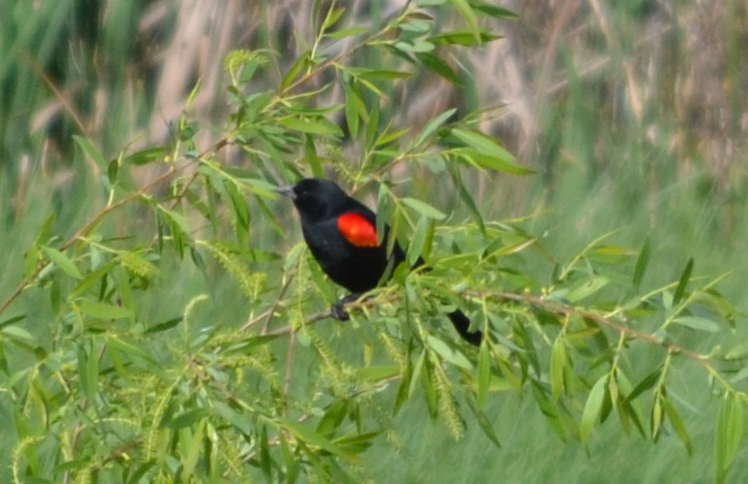 After a while a large group of birds showed up – five jakes. 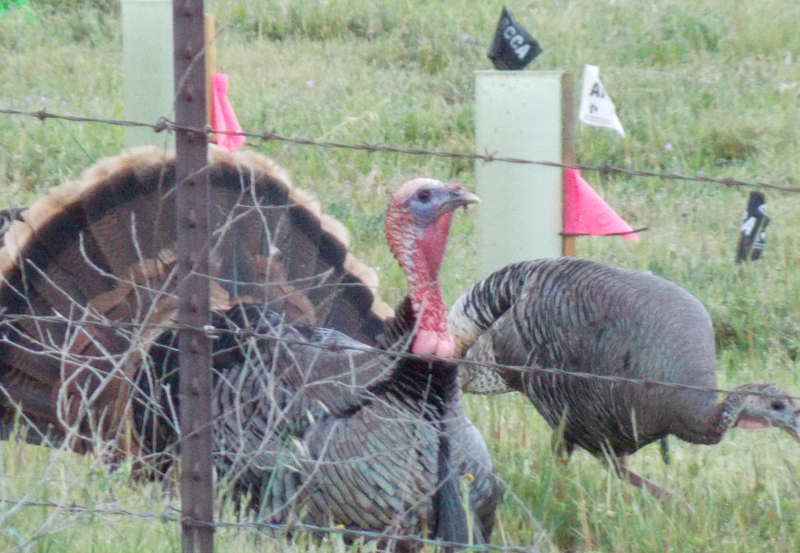 They had a bit of a confrontation with the gobbler and then high-tailed it out of his way. Apparently they didn’t was to get their butts kicked. They wouldn’t even gobble. I was very optimistic that the jakes would come if I called, and I expected them to pass up hill from me as I’d seen other birds travel that route. After calling, I waited and the young turkeys did almost exactly what I expected, but they stayed out at about 35 yards, further than I wanted to shoot. When the passed out of sight, I stood and moved to the opposite side of the tree. Once again I relied on calling to bring them back. The unfortunate part of standing behind a large tree is that you are blind and cannot look around to tree or turkeys will see you if they are present, so I was forced to wait patiently, ready to shoot. After about five minutes, a jake stepped out about five yards from me. I waited. A second jake, and a third appeared. I knew there were more so I waited for the last one. As I prepared for a shot, one of the jakes acted alarmed and the others noticed. When the last jake stepped out, he quickly moved away from me to about 20 yards. With bow drawn, I was prepared to shoot. I steadied on the bird and released. Thwack. I hit him hard. Amazingly all five jakes walked off and I could not tell by their movement that any of them had been hit. This was disappointing. When I found my arrow it was covered with moisture and feathers. I had definitely penetrated the bird completely with the arrow. I watched for a sign of the jakes. Soon one and then another appeared about 200 yards away. They were behaving routinely. I counted four. Thinking that one was down, I waited for several minutes and encountered a rattlesnake. That’s the one I videoed with my cell phone for my previous post. This rattlesnake was not happy with me. After about 30 minutes I trailed the group of turkeys to a run of oaks and came upon them. All five were back together. Bummer, I knew one was hit, but apparently this would not be the day for taking home an arrowed bird. Later in the day, I believe I located a single jake hiding out in the brush and as I headed home a few hours later, spotted four jakes standing in an open field, not far from where I’d encountered them. Archery hunting is usually exciting, and often disappointing. It’s much more challenging than hunting with a firearm and success is more appreciated. Failure is difficult to accept. I’ll have to take this experience and use it to my advantage. It will take a while to fully digest it. Wildlife was abundant on the way home. 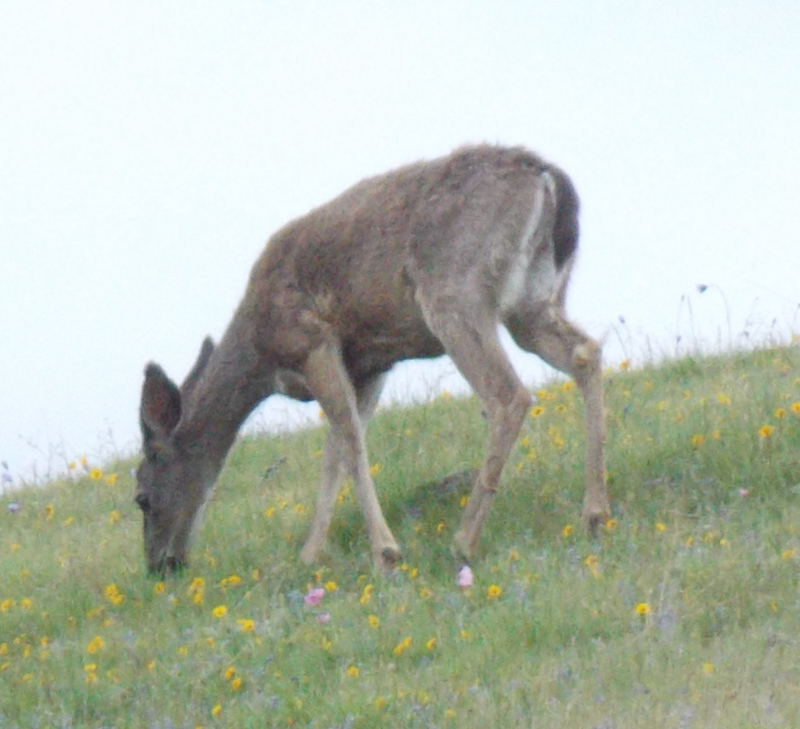 This deer grazed, surrounded by spring wild flowers. Roadside turkeys paid little attention to my truck. 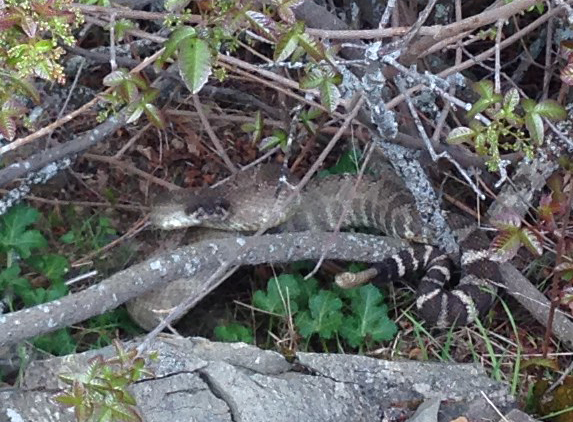 While turkey hunting, I came upon a large rattlesnake and got a pretty good video of him rattling away. Check it out.